Have you ever wonder how the Swans did on a particular date in history or wondered which league or competition they played in? Well read on to find out exactly what happened, wherever and whenever the Swans played on 27th January. 7 years ago on 27 January 2009 – The Swans hammered play-off hopefuls Preston North End 4-1 at the Liberty Stadium in the Coca-Cola Championship. A crowd of 14,774 watched Jordi Gomez, Jason Scotland, Guillem Bauza and Alan Tate score the the Swans, with the only negative being Darren Pratley leaving the field with a dislocated shoulder. 9 years ago on 27 January 2007 – Kenny Jackett’s League One Swans were knocked out of the FA Cup in the 4th Round after a 1 nil defeat against Championship side Ipswich Town at Portman Road. The defeat was all the more hard to take as it came via a questionable penalty awarded by referee Nigel Miller against Tom Williams. 18 years ago on 27 January 1998 – Swans boss Alan Cork was delighted as his side beat Darlington 4-0 at the Vetch Field in front of a Nationwide Football League Division Three crowd of 2,128. 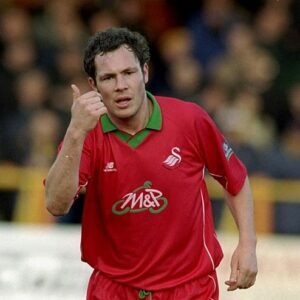 The Swans goalscorers that day were Christian Edwards, Julian Alsop, Richie Appleby and Dave O’Gorman. 42 years ago on 27 January 1974 – The first Sunday game at the Vetch Field drew a crowd of 6,712 as the Swans beat Workington 1 nil in the Football League Fourth Division. Defender Paul Bevan scored the winner as the Swans moved up to 7th place in the league table under boss Harry Gregg. Please note you did not beat Workington Town in 1974 – they are the Rugby League team! It’s Workington AFC- or Workington Reds as they are more affectionately known here in West Cumbria ! !